i.Scribe is a useful email client utility that allows you to send and receive emails. 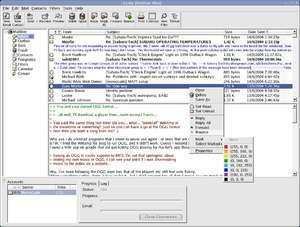 i.Scribe is a remarkably compact email program with a very straight forward and easy-to-use interface and many features, including a split view of folders and items, signatures, drag and drop, spell checking as well as an internal address book and calendar. Version 2.2.14 is a freeware program which does not have restrictions and it's free so it doesn't cost anything. For security reasons, you should also check out the i.Scribe download at LO4D.com which includes virus and malware tests. Additional screenshots of this application download may be available, too.